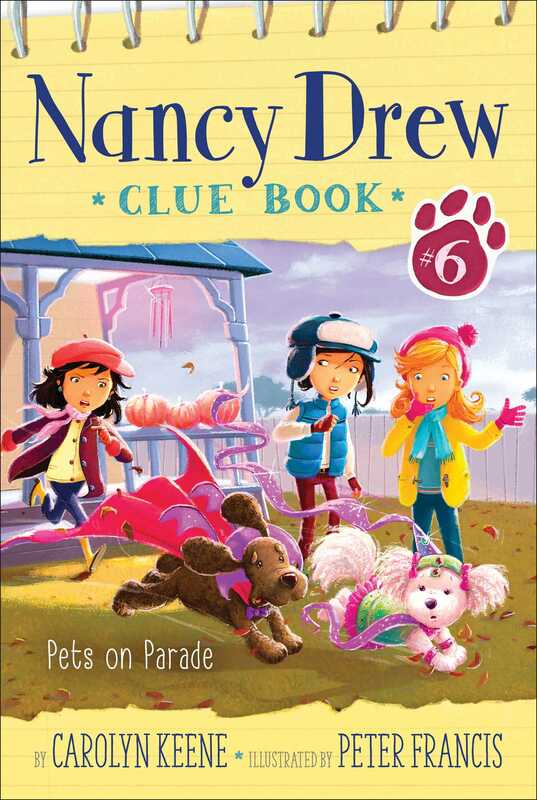 Nancy, Bess, and George solve a doggone puzzler of a mystery during the annual River Heights Halloween Pet Parade in the sixth book in an all-new, interactive Nancy Drew chapter book mystery series. Nancy, Bess, and George are gearing up for a weekend of River Heights Halloween activities, including the annual Howl-A-Ween Pet Parade! All the kids get to dress up their pets and march with them up Main Street. Nancy’s dog, Chocolate Chip, is even picked to lead the parade atop a festive hay wagon float! But right before show time, Chip starts whining, running in circles, and burrowing into the hay! When Nancy can’t calm her down, the parade officials remove her as the leader! Nancy, Bess, and George wonder if something—or someone—made Chip act that way. Nancy pulls out her clue book; the Clue Crew is on the case! Who’s behind Chip’s strange doggy behavior? Is it Deidre Shannon, who was mad that Chip was chosen over her princess puppy Pom-Pom to lead the parade? Felipe the Pet Trainer, who wanted a dog he was training to lead the parade? Or is it—yikes!—the ghost of Murray the Monster Mutt? Will the Clue Crew crack this case before all the River Heights pets go batty? Nancy Drew, also eight, couldn’t answer. She was too busy trying to keep her puppy from chasing a squirrel in the park! “I thought only werewolves howl!” George said. “Maybe vampire dogs do too!” Nancy joked. It was Friday afternoon and a few days before Halloween. Thanks to Mayor Strong the Halloween fun had already begun in River Heights, starting with a Howl-a-ween Pet Parade on Saturday. The judges were already seated at a picnic table. Instead of a picnic basket, lemonade, and potato salad, the table was covered with papers and pens. Almost anyone with a dog knew Felipe and his web series The Peaceful Pet. Felipe trained dogs the Felipe Way. That day he would demonstrate his method on a River Heights dog—Mayor Strong’s big drooling dog, Huey! Nancy nodded. She knew Chip would behave as the pets marched single-file past the judges’ table. But good behavior wasn’t the only thing the judges would look for. “And now he’s a ghost-dog!” someone cut in. Nancy turned to see Quincy Taylor from the girls’ third grade class. Perched on Quincy’s shoulder was his ferret, Slinky, dressed as a clown. “What do you mean? What’s a ghost-dog?” Nancy asked. Nancy nodded in agreement. She, Bess, and George loved solving mysteries more than anything. So much that they started their own detective club called the Clue Crew. Nancy even had a Clue Book where she wrote down every suspect and clue! As Quincy walked away the girls checked out his card. Nancy looked up from Quincy’s card to see Deirdre Shannon walking toward them. Prancing in front of her was her fluffy new bichon frise. “The dog’s name is Princess Pom-Pom,” Nancy whispered. “How do you know?” Bess whispered too. “Deirdre wrote about Pom-Pom in her blog, Dishing with Deirdre,” Nancy explained. George rolled her eyes. Deirdre Shannon usually got whatever she wanted—like her own blog and now a puppy. Deirdre stopped in front of the girls. She beamed proudly at Princess Pom-Pom, dressed like a real princess with a sparkly doggy gown and headdress. “Pom-Pom looks cute today, Deirdre.” Nancy smiled. “I think they blew a little too hard,” George joked. As if on cue, Sage Tenowitz from the second grade rushed over. Water splashed from a crystal dish she carried. “You touch doggy feet?” Bess wrinkled her nose. “Was that a promise or a threat?” George teased. “Heard that, Georgia Fayne!” Deirdre sneered. George cringed at the sound of Georgia, her real name. She hated it more than broccoli-flavored jelly beans! “Do you have a dog too, Sage?” Bess asked. Chip began howling as she strained on her leash. Another gray squirrel with a bushy tail scurried by! Deirdre tossed her hair and then huffed off with Pom-Pom. Picking up the doggy dish, Sage hurried after. “Hmm . . . probably a robotic dog,” George remarked. Bess and George were cousins but as different as a Chihuahua and a bulldog. Bess loved girly girl clothes and accessories for her long blond hair. Dark-haired George only cared about how comfortable her clothes were. And her favorite accessories were electronic gadgets! Nancy, Bess, and George strolled with Chip through the park decorated for the pet contest. There were orange balloons tied to trees and painted pumpkins everywhere! Also there were more kids from school. Andrea Wu was walking her lively terrier, Angus, who was dressed like a superhero. Kevin Garcia’s beagle, Hudson, looked funny as a dragon. Shelby Metcalf’s new parrot, Ernie, made the perfect pirate with a buccaneer’s hat and silver medallion around his feathery neck. “Woof!” Huey barked as he leaped up on Felipe. Resting huge paws on Felipe’s shoulders, Huey licked Felipe’s face with a loud SLUURRRRRRP! “This is it!” Nancy said excitedly. Nancy and Chip fell in line with the other kids and their pets. As they began to march, Nancy heard barks, meows, and squawks, but not from Chip. Her puppy’s tail wagged cheerily as they strutted calmly past the judges. “Good girl, Chip,” Nancy told her dog. The crowd spread out as Antonio Elefano walked forward carrying a cage. Sure enough there was a skunk inside! Everyone in the girls’ class knew Antonio was a jokester, but nobody knew he had a skunk—until now! Romeo seemed to yawn as he padded out from the cage. He sniffed the air before heading in Chip’s direction! “No, no, no!” Nancy cried. Using both of her hands, Nancy pulled Chip away from Romeo, but it was too late. The skittish skunk turned, lifted his tail, and—PFFFFFFT—sprayed!